IBM® Planning Analytics, powered by IBM TM1, automates your planning, budgeting, forecasting and analysis processes. It offers the full functionality of spreadsheets while eliminating manual tasks to drive efficiency. The solution accesses all your data, and it integrates financial results and analysis with operational plans for faster execution. With a dynamic planning and analytics workspace, you can model information and gain insights, communicate using compelling visualizations, make predictions and perform what-if analysis to test alternative assumptions. Ultimately, you can create timely, reliable plans to put insight into action. This is an example of IBM Planning Analytics solving a challenge for a retail organization. This visually rich workspace may be used by an analyst within a retail organization to monitor the performance of the stores. In this demo, you will see the collaborative creation of supply chain forecasts to achieve greater accuracy, optimized plans, and report with confidence. 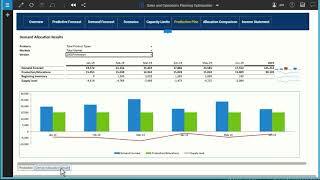 In this video, you will see how Excel is an integral part of IBM Planning Analytics. End-users continue to use an environment in which they are familiar, while enjoying the benefits of centralized aggregations, security and business rules. In this video, we will show how to build applications: starting with dimensions and hierarchies, creating cubes, loading data, business rules and performing a reorganization. Get experience with IBM® Planning Analytics by building a book for revenue planning. You use the book to adjust product units, perform what-if analysis, and analyze the impact of your changes on the income statement.